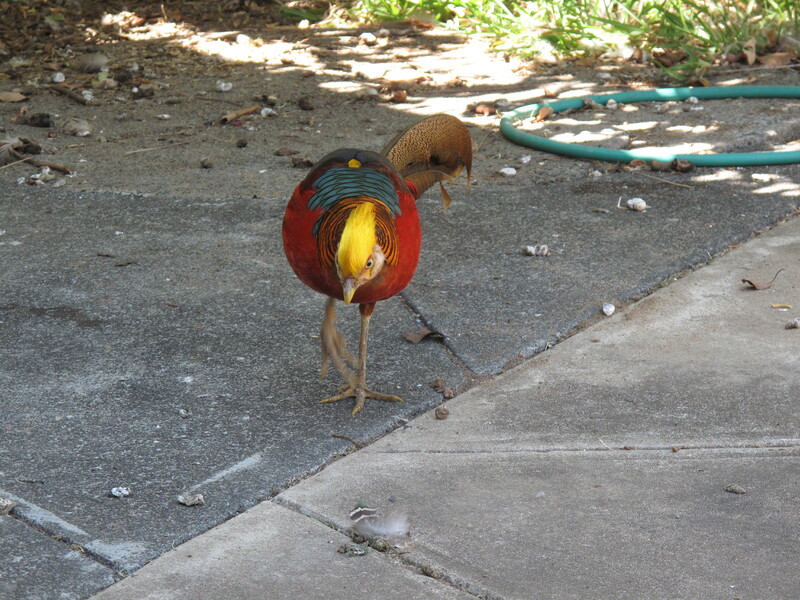 Phoenix 1, our only remaining golden pheasant (see first posts for that story), is finally, finally, coming to terms with his ‘only’ status and is my new best friend. 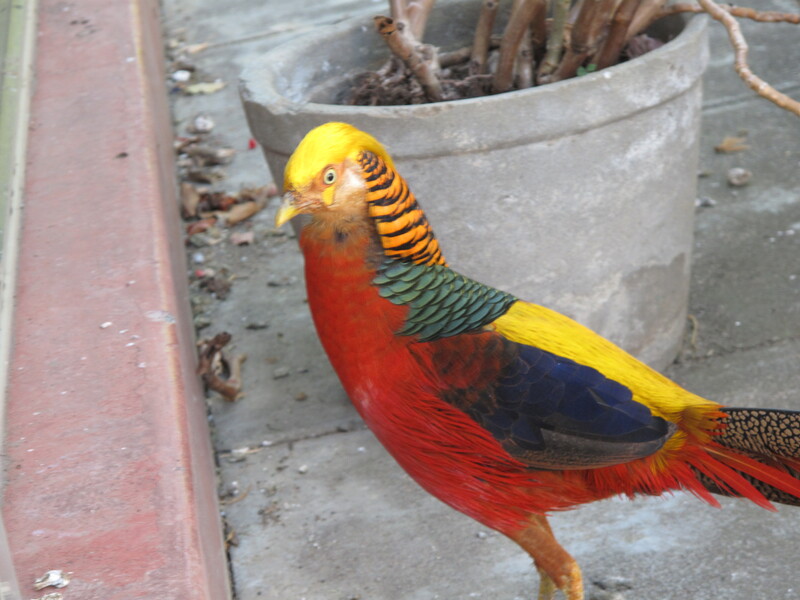 Lately he has been coming closer and closer to me at the back doorstep and he seems a lot happier now that he is interacting with the other bird breeds. I am searching for a female pheasant to keep him company but they are not easy to find. He isn’t quite as obsessed with his own reflection in the window as he used to be, but he still likes to have a quick glance now and then. Well, you can’t blame him, can you – he is absolutely beautiful and he knows it! What happened to the novella? I hesitate to speak too soon, but it looks like my patience has paid off and familiarity has bred harmony rather than contempt when it comes to interactions between our dogs and our birds. This morning we let the dogs out of their yard and kept the gang in theirs (we usually do the opposite). I sat outside and kept watch because even though the geese, ducks and emus were safely in their own yards, all of the other birds were out and about because they can fly. So the peafowl, guinnea fowl, turkeys, chooks and pheasant, were all roaming around freely and seemingly unafraid of the dogs who they usually only see through a fence. I was particularly worried about the chooks but so far so good and I’ve been able to come inside. 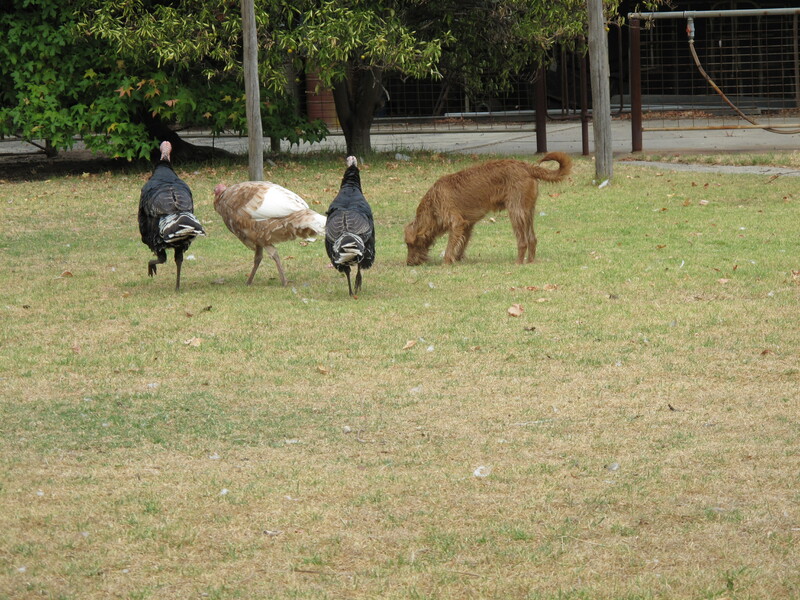 Here is Jack, the Irish Terrier, with the Bubbles and Baby Turkey. Now Jack, who is less than a year old, has never exhibited any ferocious hunting tendencies anyway, but he does like to chase things. In this sense, he and Baby Turkey have a lot in common so you could say they have both met their match and the chasing has stopped. Interestingly, Doc and Blaze (our father and son miniature dachschunds) are so busy fighting each other at the moment that neither has attempted to hunt down any of the birds. I’m not sure what is going on with those two but lately they never stop arguing and last night Doc gave Blaze a nasty bite on the ear when Son was feeding them. Doc is very jealous when it comes to our attention so poor Blaze has to constantly defer to his father and stand back. 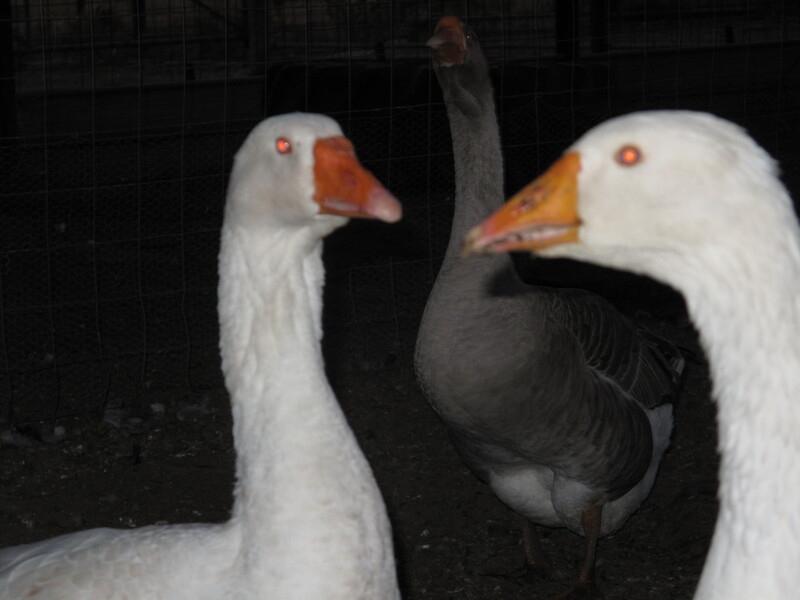 Another harmony challenge has been the introduction of a new gander to the gang. He was delivered to us by a neighbour the other day because he had lost his mate and was very lonely. The poor guy is quite scared of Godfrey’s gang and yesterday, when Son and I got back from Perth, we found him all alone by the gate and had to ‘herd’ him back to the gang and put them all in the same pen. We are calling him Leroy and hoping that with enough time in the yard with the others, he will eventually make a friend and be okay. Son says it reminds him of being ‘the new kid’ at school. The following photo is not a good one but it does show this new kid’s challenge. Leroy is on the right, Seli is on the left and Godfrey is in the background (as always!) Sometimes redeye isn’t a bad effect! In a couple of hours I pick Husband up for the weekend so I better go and hose down the area outside the back door which all our birds seem to think is the toilet – arghh! I hope nobody will be disappointed if I say that I do not buy into that whole ‘me time’ concept. My whole childhood was all about me – enough! To have an identity that wraps itself around Husband and Son in a bearhuggish way, that is reciprocated a thousand-fold by them, is a much better way to be a ‘me’. I don’t want this ‘me time’ thing I’m supposed to pursue. I don’t even know what it is; is it tapestry, or yacht cruises or real caviar? Is it writing for a living (okay, that is rather tempting); is it growing pumpkins, is it about learning how to fly? Okay, enough about me …. I find myself having little crushes on the various medical practitioners who have helped us over the last few months. I’m sure this is quite normal and is a passing phase, but I would still like to buy the doctor who visits Husband in the nursing lodge a big bouquet of flowers (since I can’t grow any). And today, when Son and I saw his surgeon for the first time since the scoliosis operation, I could hardly stop myself from flinging my arms around him. 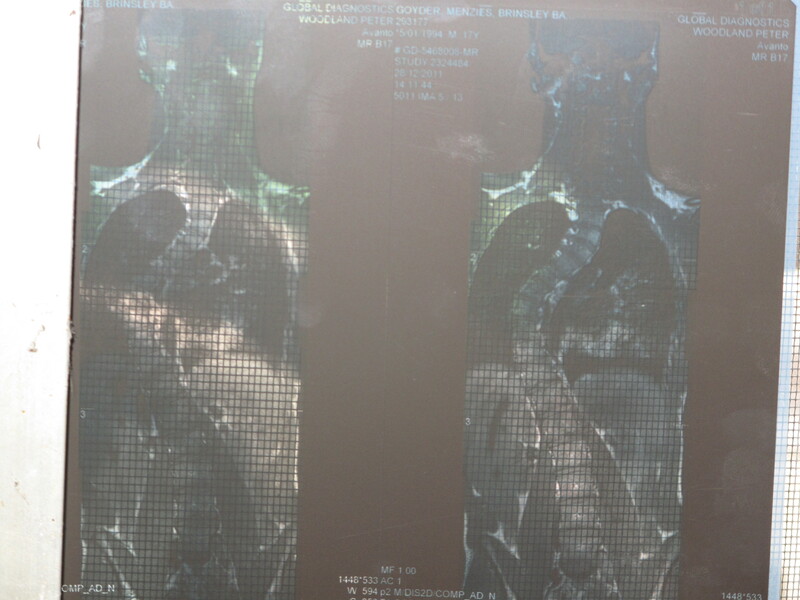 The before-and-after pictures of Son’s spinal x-rays will show you why I feel such overwhelming gratitude. Perhaps I should simply pay the doctors’ bills. That should eradicate the little crush problem I have; actually it already has! 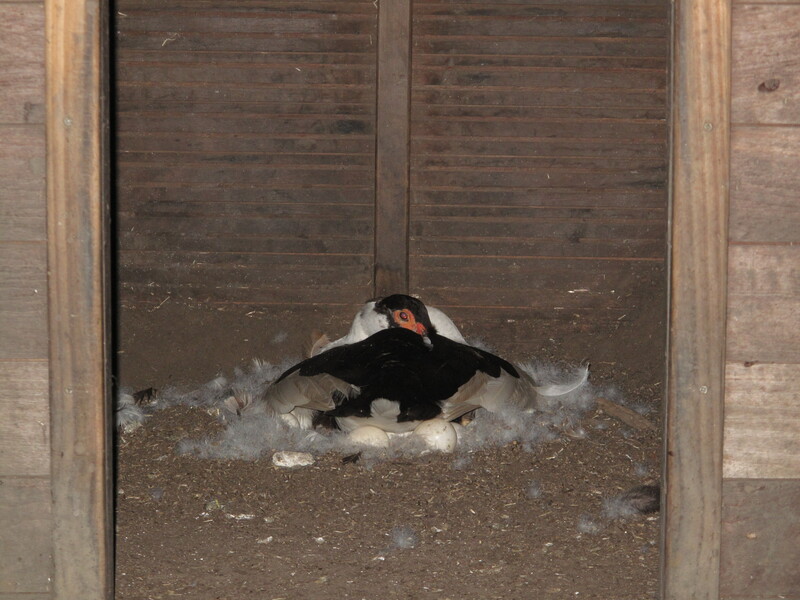 After several days of Tapper’s elusive behaviour, I thought she must have gone off with one of the wild ducks and was, perhaps, sitting on eggs somewhere in one of the paddocks. I searched everywhere to no avail and then, all of a sudden, she would turn up and have a swim in the pond, then disappear again. It was all becoming too mysterious and I was beginning to feel sad that we’d lost yet another bird…. Then, late this afternoon, after putting the gang away into their yard, I decided to go in with them, defy Godfrey (that took a bit of doing!) and sit in there on a tree stump while I waited for the hose to fill their yard pond. All of the gang, except Godfrey, came and nuzzled me for bread, which I always have in my pocket, and I had my camera ready just in case any of them did anything extraordinary. Once the bread was gone, they quickly lost interest in me and went to the pond, so I was about to get up off the tree stump to go inside and cook dinner when I had a quick look inside the little chookhouse in that yard … and that’s what the picture is of – Tapper on her eggs! 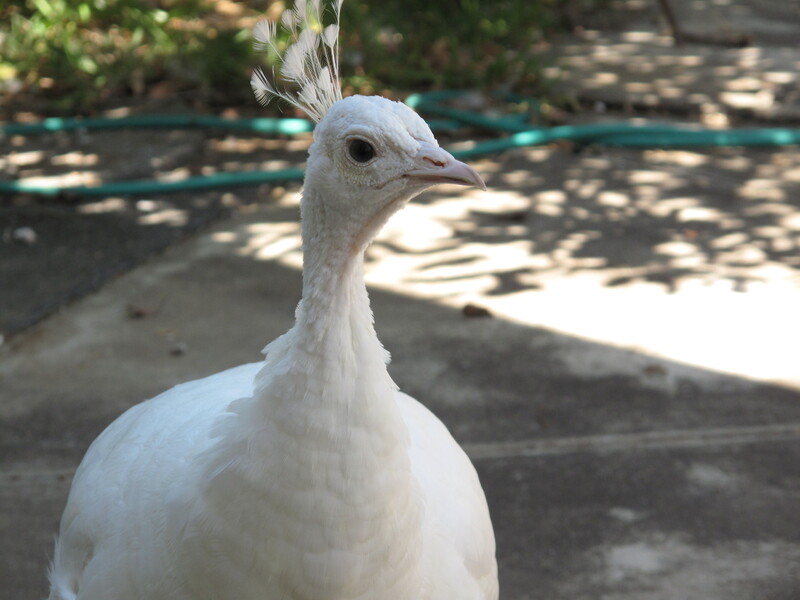 As most of you know, we have a lot of peafowl. Most of them are blue but we also have the three white ones. 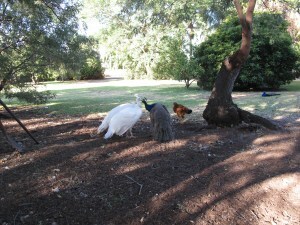 Many posts ago, I wrote about ‘Angelina’ (white peahen) and ‘Brad’ (blue peacock) and their budding romance. 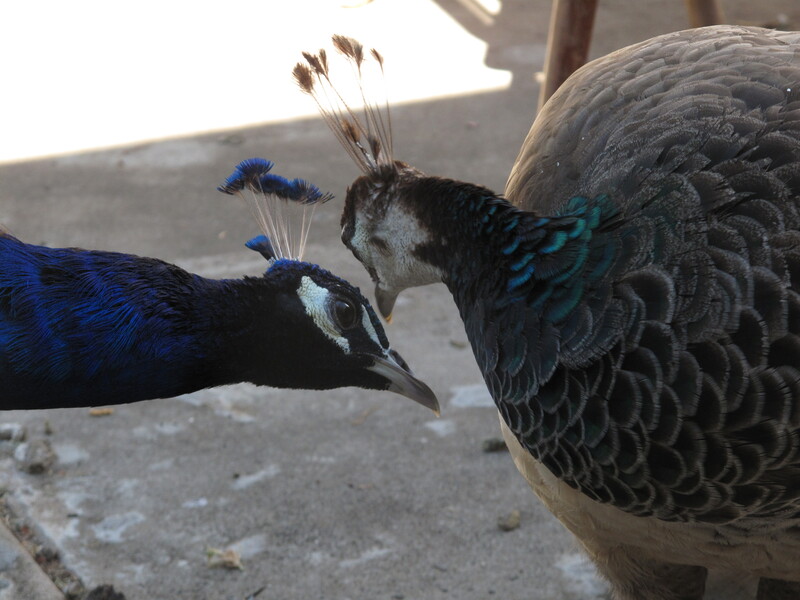 Since then, their relationship has had a few ups and downs (because all of the peacocks love Angie and all of the peahens love Brad), however they are still very much together. I hadn’t given a thought to what their offspring might look like until my friend/niece, Jane, sent me this picture from flickr…. So, the future looks very interesting indeed! 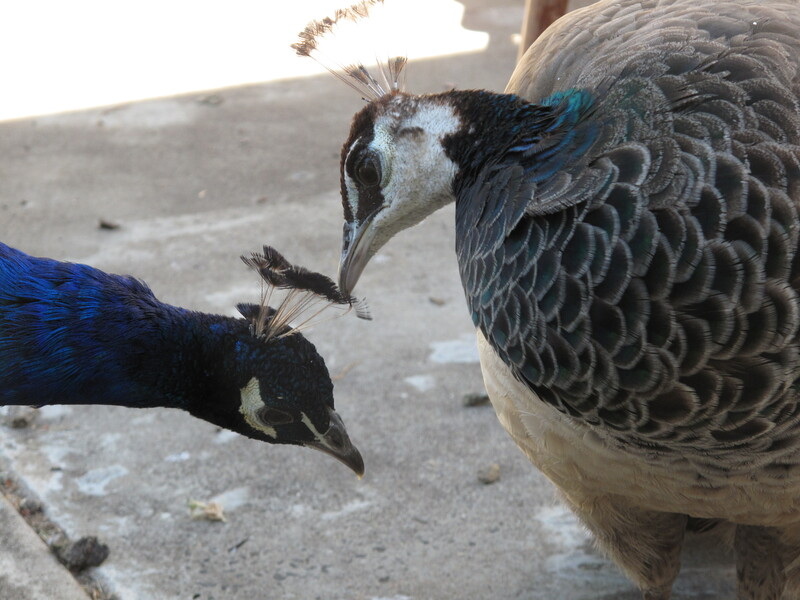 This morning I was sitting on the back doorstep feeding bits of bread to the peafowl. When I ran out of bread, I was lucky enough to witness and photograph this lovely scene. Teenage peacock (left): What perfume are you wearing? 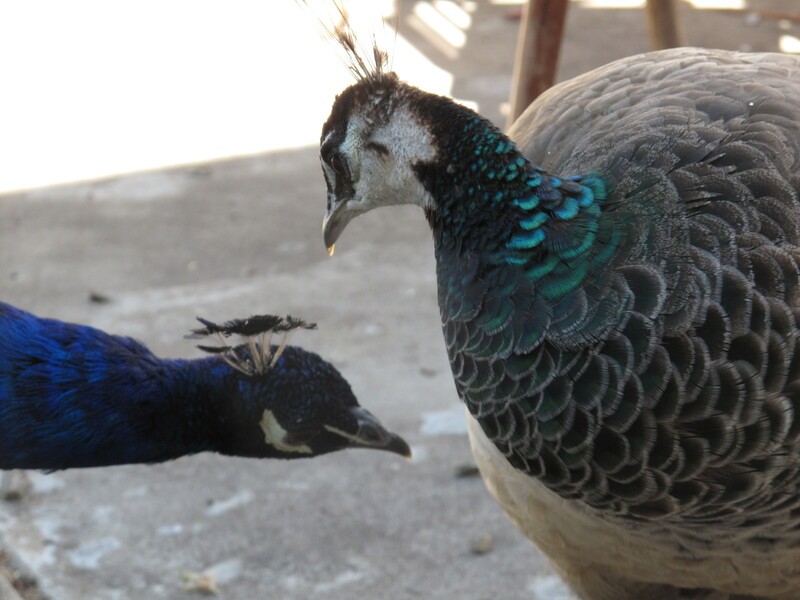 Teenage peahen: I don’t wear perfume – I’m a bird, silly! 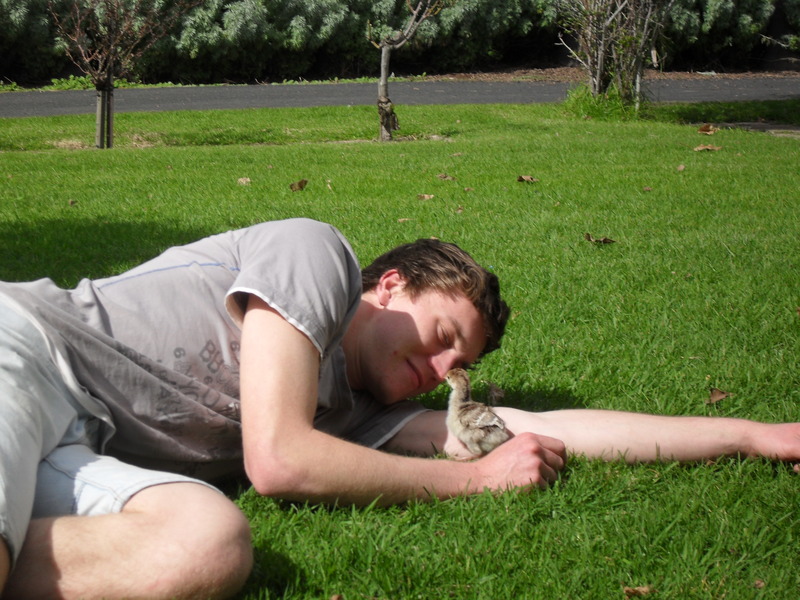 Teenage peacock: Well, you smell lovely! Teenage peahen: Thanks. Are you okay? You are acting a bit weird. 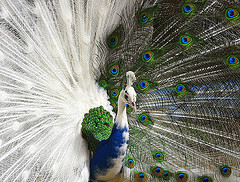 Teenage peacock: I like your shoes too. 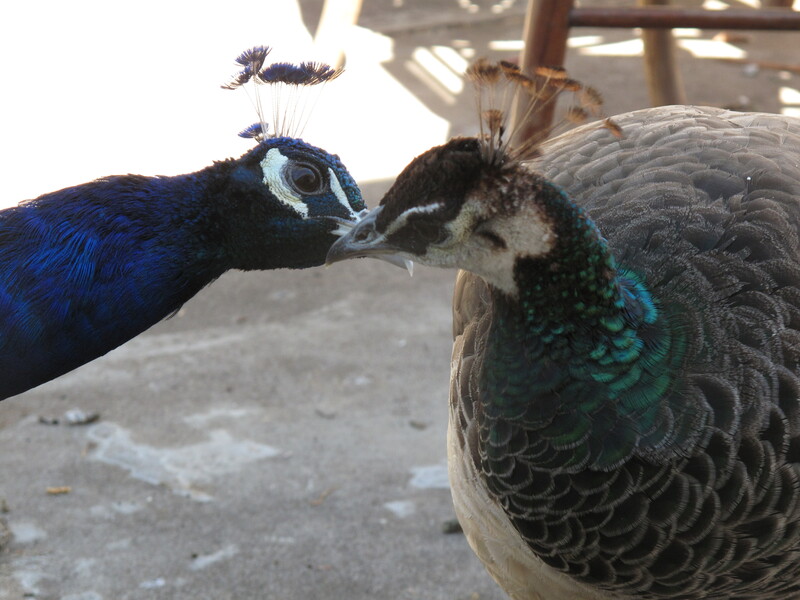 Teenage peahen: Oh, will you just stop these ridiculous compliments and kiss me? Teenage peacock: I thought you’d never ask! Once again, romance is born! Son is, understandably, having a few problems with anger. His dad is in a nursing lodge, he himself is in a back brace and can’t do much for awhile, and his mother (me) always leaves the teaspoon, that she stirs her morning coffee with, on the kitchen table, making a little mark that needs to be wiped off with a sponge. Yes, the teaspoon situation is very like the toothpaste lid on/off problem that apparently drives many previously happy couples, friends, partners etc. either to drink, divorce or dissolution – or all three! So, why do I do this teaspoon thing? Usually I am not provocative, feisty, rebellious, contrary or uncooperative. Usually I would do anything to keep the peace but, for some perverse reason, the fact that leaving the teaspoon on the table enrages Son (he can be a bit of a neat freak, just like Husband), keeps me doing it. In fact, I now make it my job to leave that teaspoon right in the centre of the nice clean white table just to see what will happen. It’s the closest I have been to adventure for some time. Sometimes it takes awhile for Son to notice. 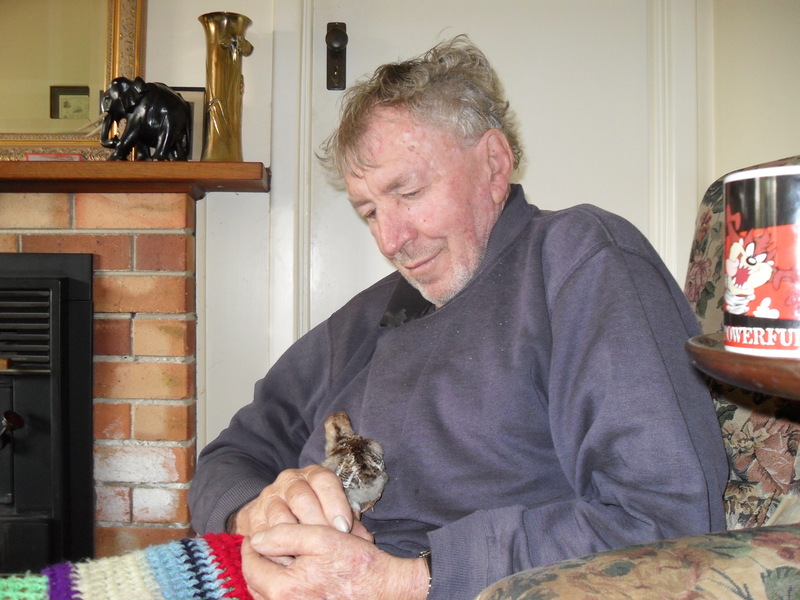 I’ll be out in my little office writing, or at the back doorstep feeding the peafowl, or doing the laundry, and I will hear him emerge from his bedroom, yawn, yell good morning to me, get his weetbix, turn the morning news on and so on. I wait with a sense of adrenaline-fuelled anticipation for his outburst because I now have the best weapon ever to combat his rage – laughter. Oh yes (or maybe that should be oh no), I am not going to be in fear and trembling any more. Now, obviously I don’t do this every morning, or it would lose its impact. Mostly, I put the stupid teaspoon on the sink to be washed as I have been instructed to do by Son and, when you think about it, he is only copying Husband’s and my own breakfast routines drilled into him when he was a placid little boy. But, when I do leave the teaspoon on the table, I feel a wonderful sense of glee while I wait for the reaction. “MUM! YOU’VE DONE IT AGAIN – I’VE TOLD YOU A MILLION TIMES AND I’M SICK OF YOU LEAVING THE TEASPOON….” Blah, blah, blah. This brings an immediate grin to my face and I race into the kitchen and pretend to be all apologetic and then cannot stop laughing at the look on his face – oh it is wonderful! He stomps off, I continue to laugh until he re-emerges from his room laughing too. I love it but realize that we will soon have to find another form of entertainment. The three of us are learning a lot and that’s a very good thing, but sometimes I wish I could go back, just a little bit, in time…. 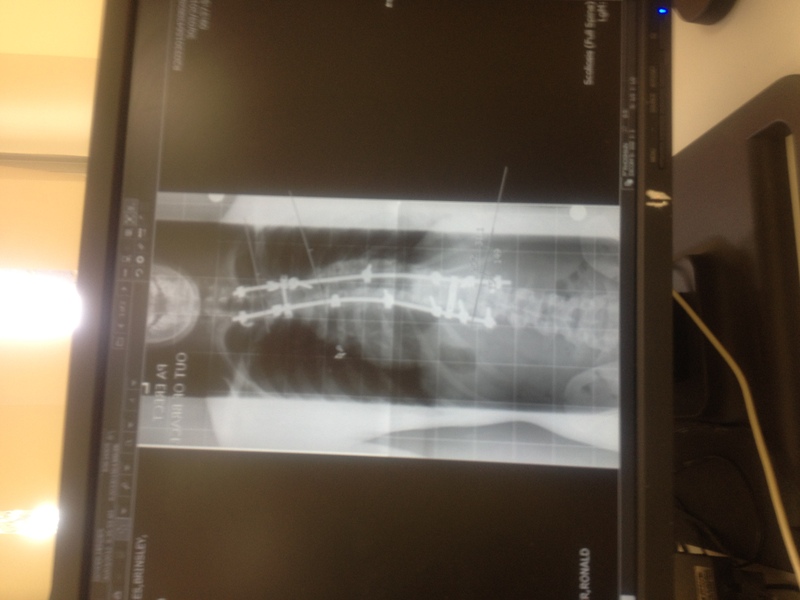 For any newcomers to this blog, Husband is now in a nursing lodge due to advanced Parkinson’s disease and prostate cancer, and six weeks ago Son had major surgery on his spine for a severe scoliosis. The turkey chick in the picture was our first ‘Bubble’. As for me, I love teaspoons!